This is ebook 5 in the Marketing for Magicians Series. Suppose you told the schools that you could provide a quality educational magic-themed school assembly at NO COST to the school. That is right, a school assembly, at positively no cost to the school. How many schools do you think you could book with this offer? 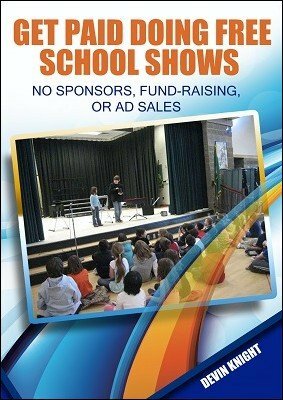 This ebook has an innovative way to book your educational magic show into elementary schools and it is little known. Most magicians that have been doing this have been hush-hush about it. This ebook contains a practical solution to that problem. Now you can offer schools your school assembly FREE and still be paid for doing it. You will find that in many cases you will make more money, than your regular show fee! This ebook contains a detailed systematic plan giving all the details and resources you need so you can start giving away FREE school assemblies and be paid for it. Stop making excuses, this new program will get you all the school shows you want. If you want to visit a particular part of the country, just call the schools in that area and offer your free show. Your trip will be paid for with all the free school assemblies you will do. It is possible to make several thousand dollars a week with FREE school assemblies. Everything you need to know is in this ebook. Start doing this in your area before someone else contacts the schools and does this plan.